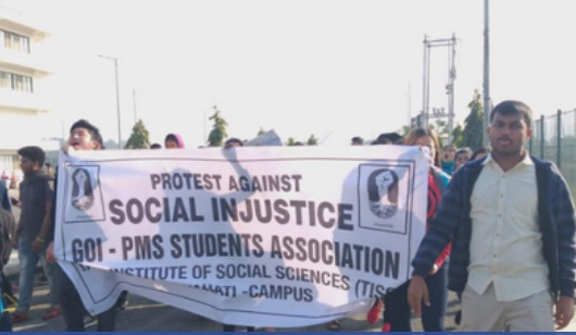 The agitating students of Tata Institute of Social Sciences (TISS) Guwahati have dashed off a letter to the North East Students’ Organisation (NESO), seeking support towards their ongoing agitation. The students of TISS Guwahati have been protesting against discontinuation of benefits under the Government of India-Post Matric Scholarship (Gol-PMS ) scheme. The agitation by the students of TISS Guwahati entered the third day on Saturday. According to reports, the first round of talks with the institute’s authority did not yield any result. The agitation has been led by the Gol-PMS Students’ Association. A report published on Saturday by The Shillong Times stated the students are demanding complete fee waiver for SC, ST and OBC (Gol-PMS) students, implementation of National Commission for Schedule Tribe recommendations and a mechanism for affordable education. It has been reported that over 60 students, belonging to the underprivileged families including ST/SC/OBC with an annual income less than Rs 2 lakh, have been enrolled in the 2018-19 session.